The hymn thus written seemed to express the experience of both Mrs. Knapp and myself. “Blessed Assurance” was made in this manner. My dear friend, Mrs. Joseph F. Knapp, so well known as a writer and singer of most exquisite music, and as an aid and inspiration to all who know her, had composed the tune, and it seemed to me one of the sweetest I had heard for a long time. She asked me to write a hymn for it, and I felt, while bringing the words and tones together, that the air and the hymn were intended for each other. In the many hundred times that I have heard it sung, this opinion has been more and more confirmed. This hymn by Fanny Crosby and Phoebe Palmer Knapp (1839–1908) was published three times in 1873, including John R. Sweney’s Gems of Praise, No. 1 (Philadelphia: Methodist Episcopal Book-Room, 1873 | Fig. 1), in three stanzas with a refrain; on the back page of an issue of Guide to Holiness (NY), a periodical edited by Knapp’s parents, Walter C. Palmer and Phoebe Worrall Palmer; and in Bible School Songs (1873), edited by Knapp and J.H. Vincent. Fig. 1. John R. Sweney, Gems of Praise, No. 1 (Philadelphia: Methodist Episcopal Book-Room, 1873). 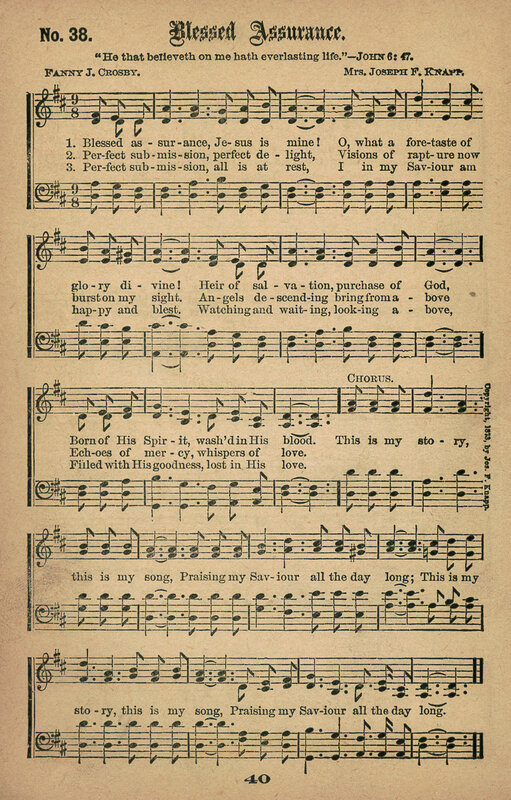 The hymn was modified for inclusion in Gospel Hymns No. 5 (Chicago: Biglow & Main, 1887). In the first stanza, “purchased” became “purchase,” and in the second stanza, “rapture burst” became “rapture now burst.” The harmonization differs in some respects. This version of the hymn has become the standard form adopted into hymnals. Fig. 2. Gospel Hymns No. 5 (Chicago: Biglow & Main, 1887). And because of this reality—being washed in the blood of Christ, reborn through the Spirit, “bought with a price” (1 Corinthians 7:23) out of slavery to sin, to become heirs of God’s rich inheritance He has planned for us—we have a “full assurance.” It is no wishful thinking; our faith stands upon the promises of God, and “we may have confidence, and not be ashamed before Him at his coming” (1 John 2:28). We have “the assurance of things hoped for, the conviction of things not seen” (Hebrews 11:1). This is not a “hope” in the sense that I “hope” my car will start in the morning, or I “hope” my job will continue. This is a hope for the future based on a present assurance, founded on immutable truths. Edith L. Blumhofer, Her Heart Can See: The Life and Hymns of Fanny J. Crosby (Grand Rapids: Eerdmans, 2005), p. 347. Ira D. Sankey, “Blessed assurance,” My Life and the Story of the Gospel Hymns (Philadelphia: Sunday School Times, 1906), pp. 136-139. Hugh T. McElrath, “Blessed assurance, Jesus is mine,” Handbook to the Baptist Hymnal (Nashville: Convention Press, 1992), p. 100. Carlton R. Young, “Blessed assurance, Jesus is mine,” Companion to the United Methodist Hymnal (Nashville: Abingdon Press, 1993), pp. 237-238. Bert Polman, “Blessed assurance, Jesus in mine,” Psalter Hymnal Handbook (Grand Rapids: CRC, 1998), p. 659. Carl P. Daw Jr. “Blessed assurance,” Glory to God: A Companion (Louisville: Westminster John Knox, 2016), pp. 801-802.